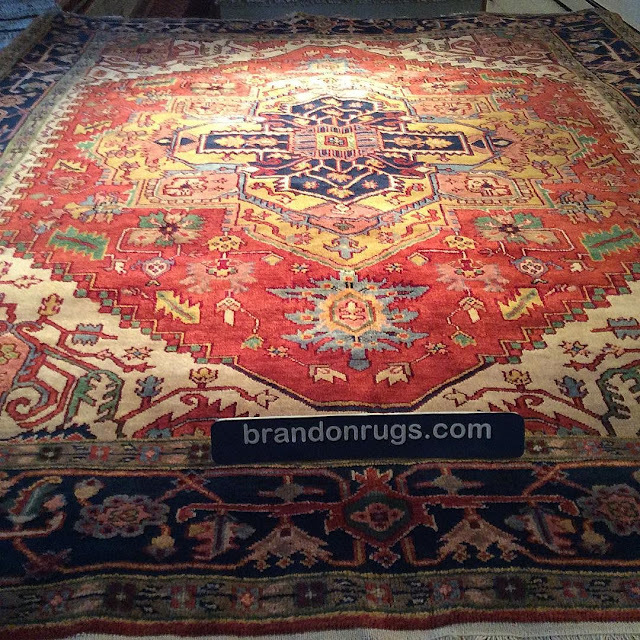 Brandon Oriental Rugs is "more than a store. We're a service." Our customers, an eminent chef and his wife, living near #Hershey PA, showed their #goodtaste by selecting this reproduction #artsandcrafts #williammorris #donegal design #orientalrug to advance a #makeover of their #bedroomdecor in one of the rooms of their home. Back in the 1990's (back before the Apple iPhone, back before "apps"; almost at the dawn of the internet - to give you a sense of how long ago), our customers in #Doylestown PA (who had just moved into a newly built home) decided to apply good sense to decisions they were then making about the furnishing and decoration of their then #newhome. Knowing the reputation of REAL hand-knotted oriental rugs regarding durabilty, cleanability, collectability and ability to maintain value versus ALL other #floor-covering choices, our #DoylestownPA customers chose a #real #rug for a casual #familyroom adjacent to their open-floorplan #kitchen area. 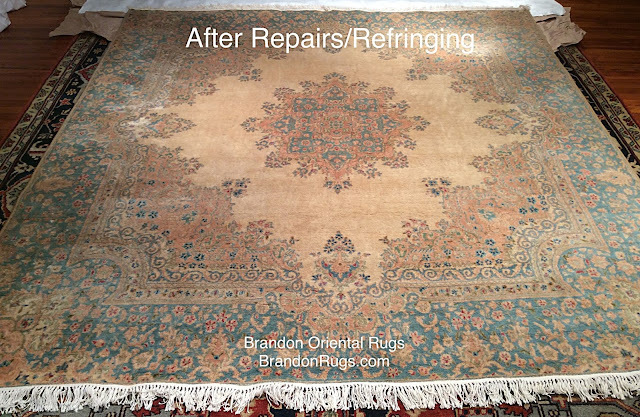 Recently, (after over twenty years of daily treadmill-style wear-and-tear by the family) they asked Brandon to clean their rug and replace the fringe. It is seen here #like-new, back on duty in ALL ITS GLORY in our customer's #Doylestown PA home. 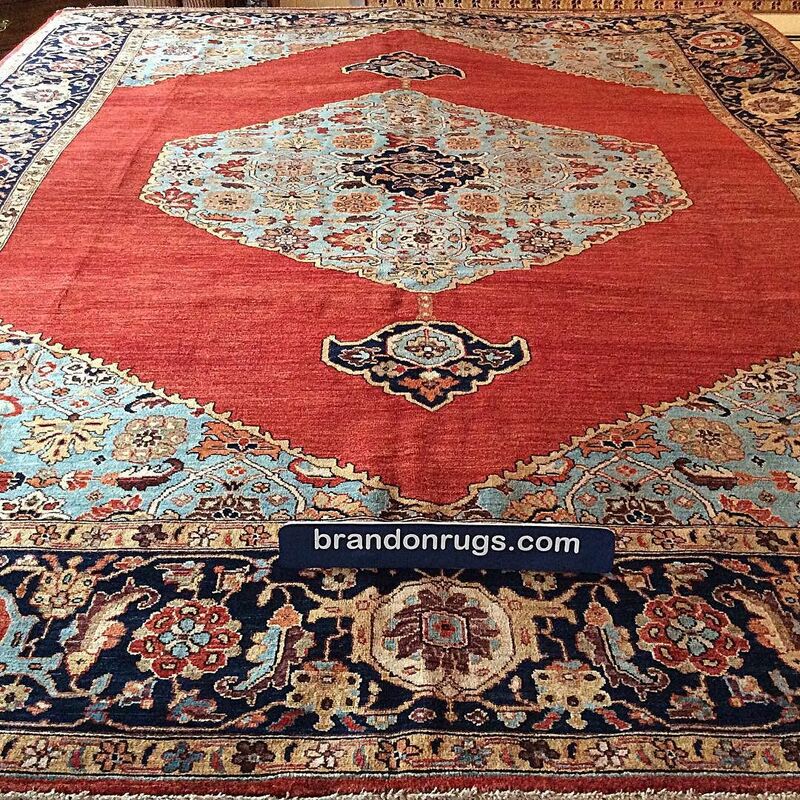 Brandon Oriental Rugs - #BucksCountyPA - recommends cleaning and repairing your fine quality handmade rugs to preserve like-new appearance and extend useful life. Give your #orientalrugs some love; they're always worth at least what you paid for them. 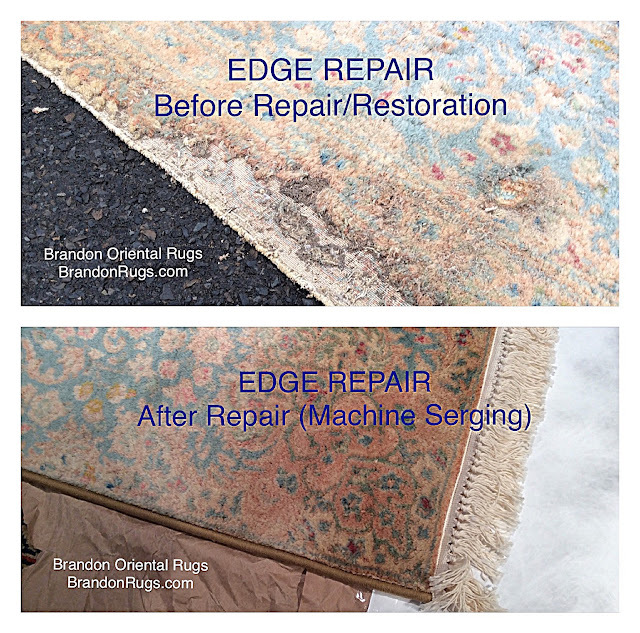 Brandon Oriental Rugs - #BucksCounty PA - recommends cleaning and repairing your quality #wool-pile #arearugs to preserve like-new appearance and extend useful life. 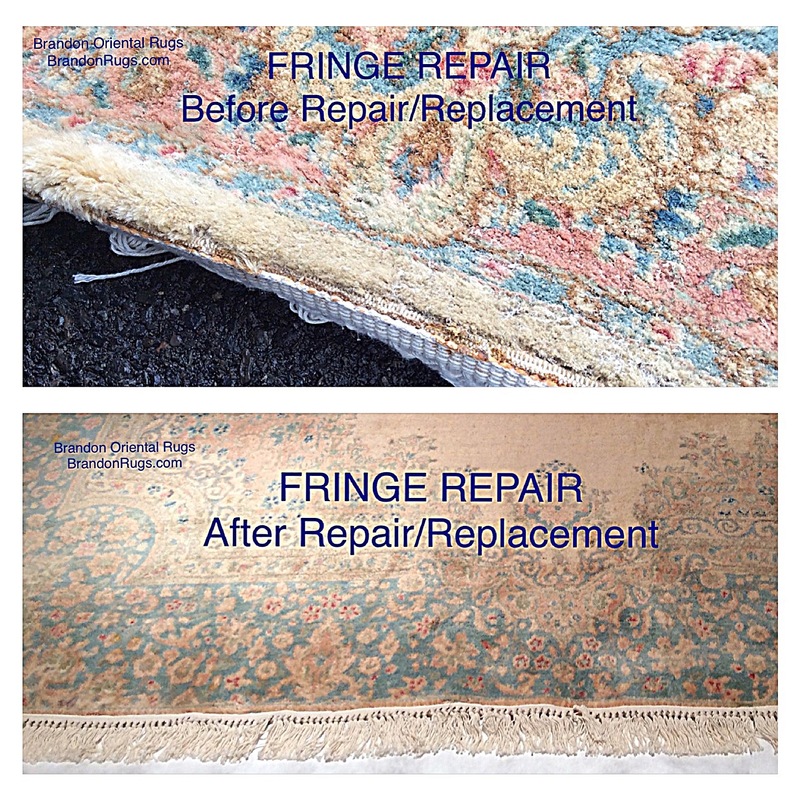 We removed the old damaged fringe, and all torn areas from ends of the woven face of the rug; bound the new clean-line at the ends; and replaced the old fringe with new that matched the original. 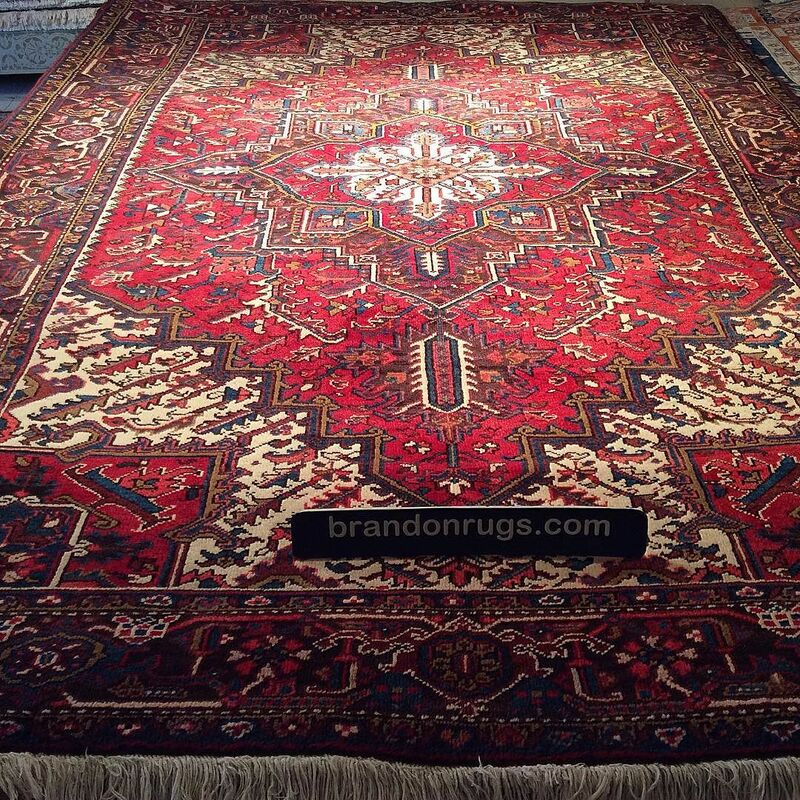 * - Brandon Oriental Rugs ONLY offers for sale REAL hand-knotted oriental rugs; and traditional, authentic kilims, dhurries, tapestries, and similar flatwoven rugs and textiles. 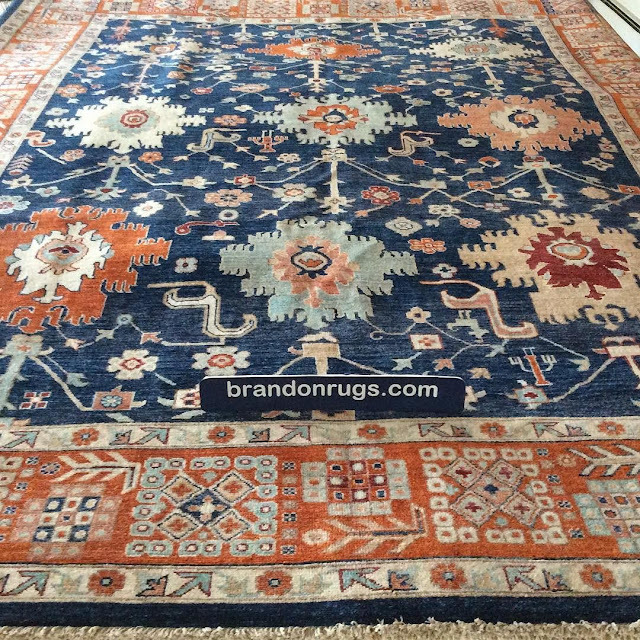 We DO NOT offer for sale, promote or recommend machine-made rugs; tufted (so-called handmade) rugs; or rugs composed mostly of synthetic materials. Brandon Oriental Rugs - #BucksCounty PA - recommends cleaning and repairing your fine quality handmade rugs to preserve like-new appearance and extend useful life. Give them some love; they're always worth at least what you paid for them. This rug - a 10x10 square Persian Kerman - was inherited by our #WarminsterPA customer in moth-eaten condition. A significant area of the outer guard stripes of the border complex had been eaten away to a degree that made reweaving/re-knotting of the rug more costly than the rug's present market value justified. To economically repair the rug and permit continuing use of it, we recommended cleaning and moth-proofing of the rug folowed by the removal and repair of damaged areas to restore appearance. As seen in "before and after" images above and below, we cut away the damaged areas (rather than re-knotting them); and machine-serged the edges all around (rather than hand-binding the edges and overcasting the ends.) After the rug was serged around its entire perimeter, we replaced the fringe at the ends as shown below. The choice of repairs selected offered considerable savings to our customer compared with what would ordinarily be sought and recommended to achieve a museum quality repair. The rug is a little smaller than it once was, but looks remarkably good after the insult it suffered from the moths. It now is ready to be placed in a lovely new room awaiting its arrival in Florida where it promises to provide our customer many years of extended use. 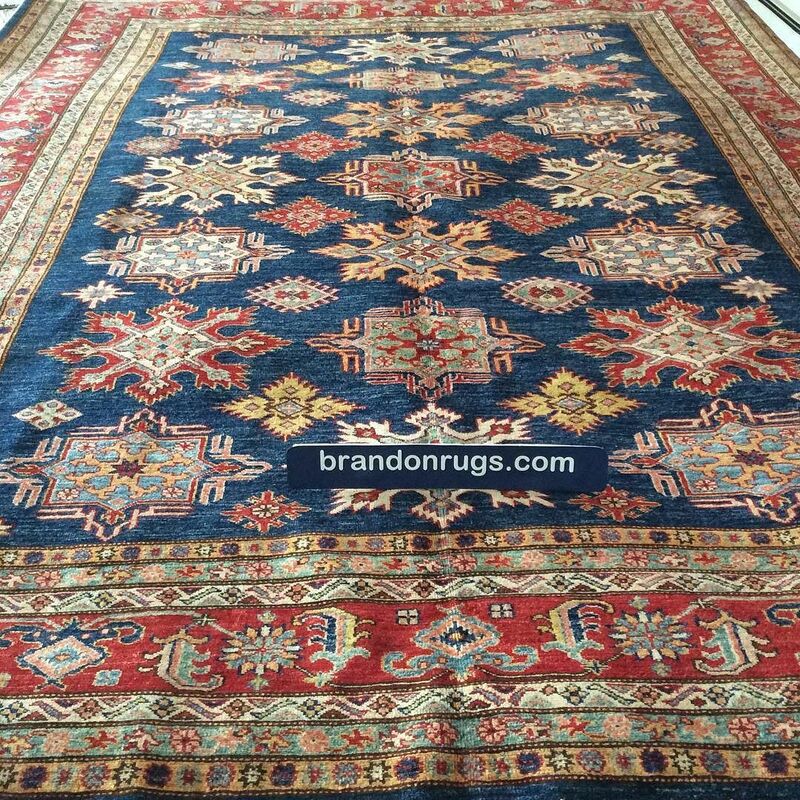 8-3x10-7 hand-knotted #Persian #orientalrug made in Iran. Post-revolution production (contemporary) Sarouk #design. 7-9 x 11-3 hand-knotted #Persian #orientalrug made in Iran. Mehmeh (Joshaghan) #design. 6-7x10-3 hand-knotted #Persian #orientalrug made in Iran. Mehrevan (Heriz) design. 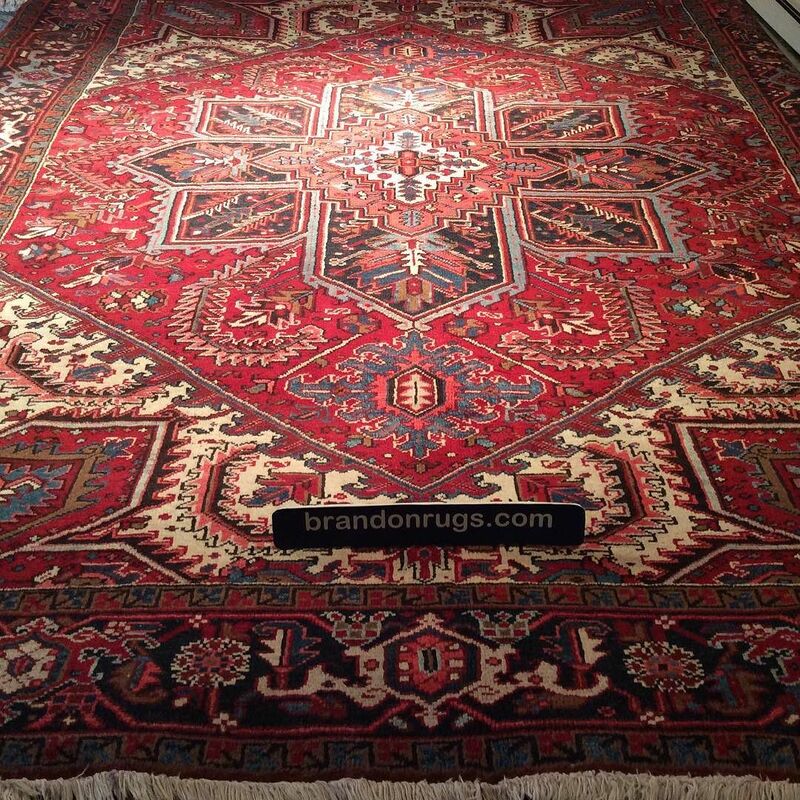 8-3x10-7 hand-knotted #Persian oriental rug. Made in Iran. Heriz #design. 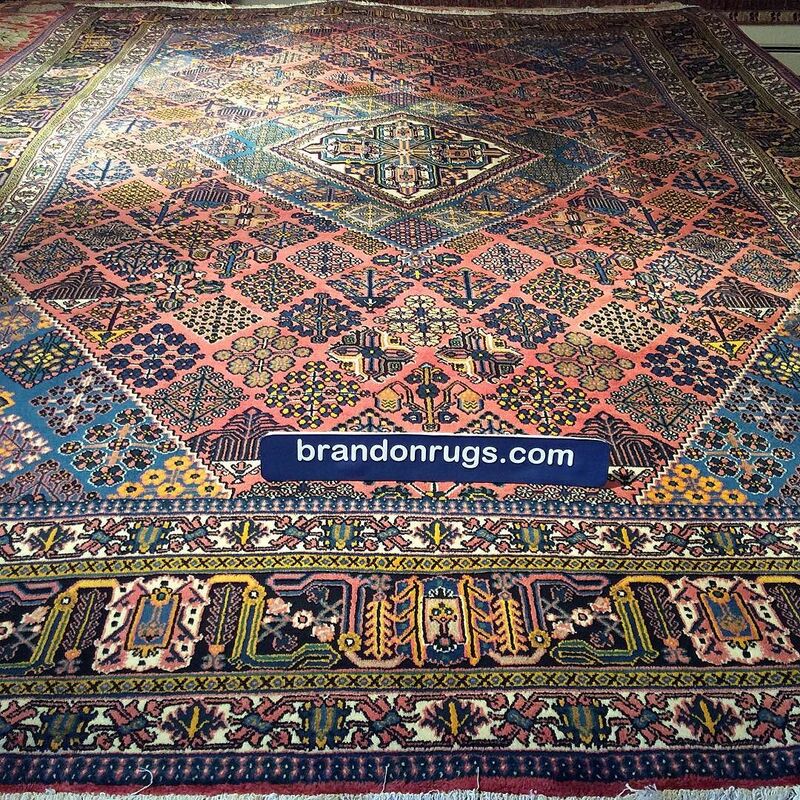 7x10 hand-knotted #Persian #orientalrug made in Iran. Yalameh design. 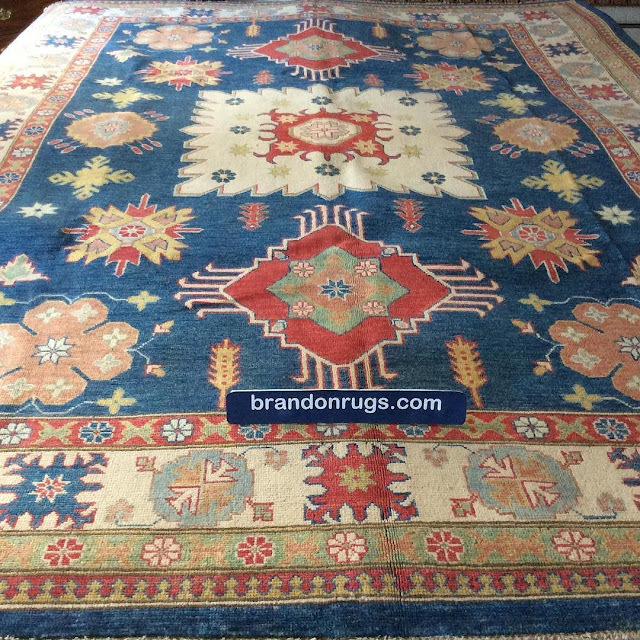 8x10 hand-knotted Pak Kazak oriental rug. 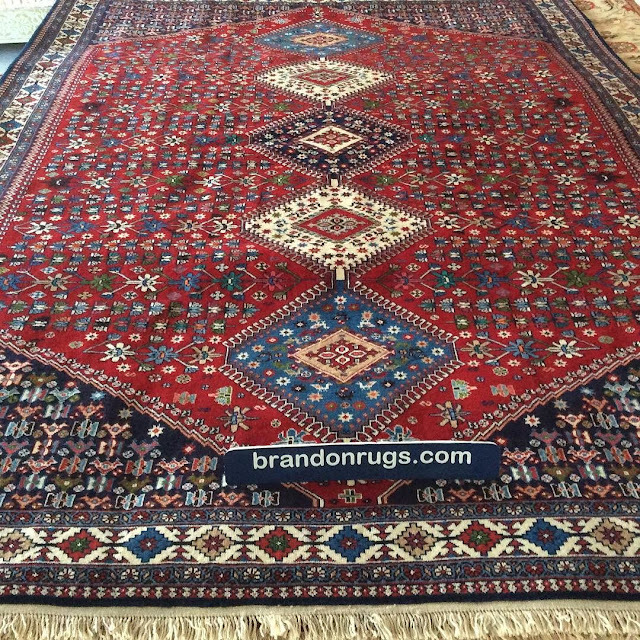 9x12 hand-knotted Pak Kazak oriental rug. Brandon Oriental Rugs - #diningroomdecor is advanced to completion by a hand-knotted #orientalrug with all the right color and character in our customer's two hundred year old #farmhouse in #Quakertown PA.
Brandon Oriental Rugs - A hand-knotted #orientalrug #runner complements the previously selected #entryhall #rug in our customer's #Warrington PA #home . Brandon Oriental Rugs - A combination of three hand-knotted oriental #antiquerug reproductions graces the #hardwoodfloors of the guest #bedroom in our customer's two hundred year old #farmhouse in #HuntingdonValley PA.
Brandon Oriental Rugs - A combination of hand-knotted oriental #antiquerug reproductions graces the floor of the guest #bedroom in our customer's two hundred year old #farmhouse in #HuntingdonValley PA.
(BrandonRugs.com) A #hand-knotted #orientalrug is the #perfect #accessory and #finishingtouch for this #diningroom in #Jamison PA. Note that the medallion IS visible under the table and contributes to visual flow around the table and room. 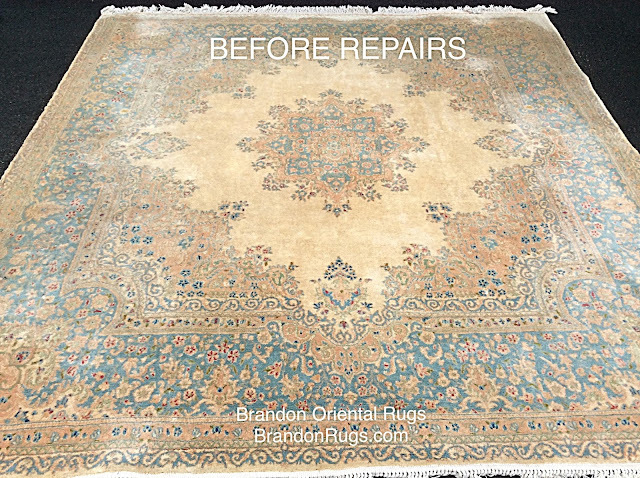 #Doylestown, Pa new #homeowners in search of a "not costly" REAL hand-knotted #orientalrug (NOT tufted or machine-made or woven and adulterated with synthetic materials) - after several failed attempts to find a satisfactory solution via rug "e-tailers" on the internet - invited #BucksCounty #rug-store Brandon Oriental Rugs (BrandonRugs.com 215-794-2300) to help them. This is the lovely selection that will grace their home for years to come. The choice was made from among several alternates - all presented free of charge in-home with no obligation. The only effort required on the part of the buyers was to provide a few search parameters to guide Brandon's efforts on their behalf. BrandonRugs.com - 9x12 hand-knotted reproduction Serapi design #orientalrug made in India.